New model of AIR bearing, which has overwhelming rotation capacity, is now released. The new model is really good at cost performance. The housing of AIR BFS （Bait Finesse Special）is detachable so that you can replace just the bearing when it become worn. The super micro ball, which is feature of AIR bearing, is high-precision stainless-steel. The rotation is very smooth and silent. The performance is quite helpful to cast light-weight lures. you can cast lures of the MAX 1oz class, not to mention what is most suitable for finesse fishing with baitcast reel. 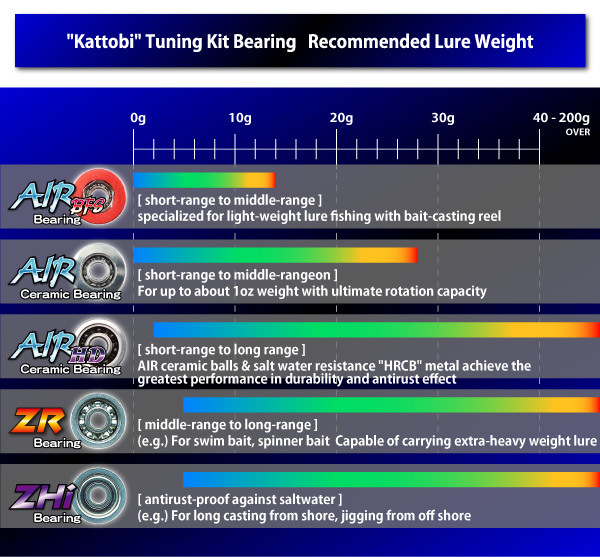 The bearing is NOT a weak design for exclusive use to finesse fishing with baitcast reel. Having a rotary response by casting a ultra lightweight lure, you can taste the same sense as the use of normal bearing. Once you try the "AIR" and cast it, you can feel the difference. Please experiance the ultimate rotation performance of " AIR bearing". "HD(Heavy Duty)" version of AIR ceramic bearing known for ultimate rotational performance! The bearing is made up of a combination of high accuracy ceramic balls and rust resistant HRCB metal. Then it achieves the highest performance level of rotation and antirust effect. It covers every type of fishing style such as "bait fineness", long casting with heavy lure, jigging at saltwater etc.. Thus this is all-round bearing with an excellent rotation & strong rust resistance. The surface of the bearing is open type and the back side is shield type, which improves the maintenance performance. With its excellent durability, it can manage to do jigging with 100g weight or more. HRCB antirust-proof performance is more than ten times better than that of conventional stainless steel bearings. Although the rotary performance is equivalent to ZR basically, the bearing has still more antirust performance against salt water. This is also all-round bearing which bears severe situation, for example long casting and deep jigging from shore such as the surf and rocky area. By applying both-sided shield, it prevents dust and seawater from penetrating the inside of bearing.